Magnesium is a mineral which is essential for the good health of all cells. 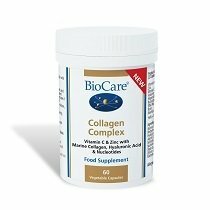 It supports a variety of physiological processes including energy metabolism, muscle and nerve function, and the maintenance of bone and teeth. Magnesium Citrate – this potent magnesium supplement is easily absorbed by the body and is suitable for everyday use, making it perfect for people who need to supplement their daily intake of magnesium. Magnesium Taurate – combines magnesium with the amino acid L-taurine. This supplement is beneficial in contributing to the normal function of the nervous system. Magnesium Malate – a complex of malic acid and magnesium, this supplement helps with reduction in tiredness and fatigue and muscle function. 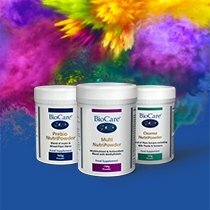 Our innovative Magnesium Powder remains a popular choice amongst BioCare® customers who enjoy the flexibility and convenience of the powder format, allowing them to take as much or as little as they need. This supplement is a complex of magnesium citrate and magnesium malate and contributes towards normal muscle function, maintenance of normal bones and teeth, as well as the reduction of tiredness and fatigue. Together with calcium, magnesium is important for ensuring the optimal health of the body and these minerals are vital for the well-being of the musculoskeletal system, in particular. Whilst magnesium supports normal muscle function, calcium plays a role in maintaining healthy teeth and bones. We’ve combined these two powerful minerals in a convenient supplement – Mag2:1 Cal. For people who suffer from malabsorption or poor magnesium levels in their body, we recommend the EAP Complex which is a highly absorbable and well tolerated magnesium supplement. 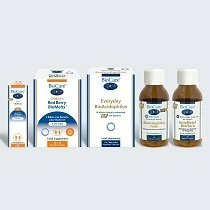 Discover which magnesium supplement is right for you by browsing our entire range below or get in touch with our team of specialists if you require any assistance. We’re always happy to help!